Featured in this episode: Cat Bradley, Darcy Piceu, “The Long Ranger” Justin Simoni, Bryan Williams; Buzz Burrell; Peter Bakwin; with hosts Russ Rizzo and Kelly McConnel. 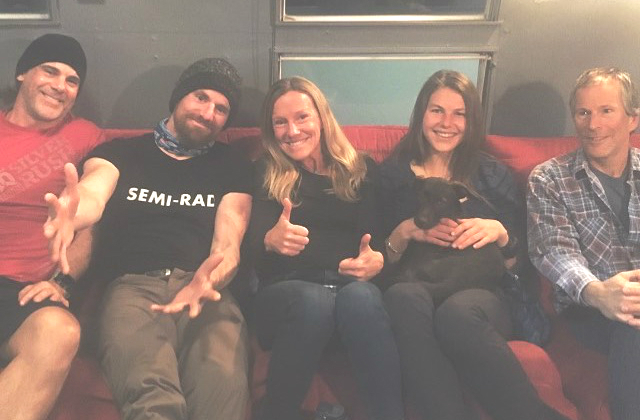 We packed The Studio (Boulder) Airstream with a grip-load of talent to dive into the topic of fastest known times (FKTs). We talk with four athletes who set new records in 2017: Cat Bradley, Darcy Piceu, “The Long Ranger” Justin Simoni and Bryan Williams. Two legends of Boulder joined us to guide the conversation: Buzz Burrell of Ultimate Direction and Peter Pakwin (both of whom hold their own claims to fame, from speed records of the Flatirons in Boulder to running the double-Hardrock). The attention tonight is on the 2017 speedsters. In this episode, we meet Cat’s beloved puppy, Surely, and learn about her years-long quest to notch a Grand Canyon FKT. We laugh as Darcy tries to convince us she was out there having fun and chatting up all sorts of strangers as she cut 12 whole hours off of the women’s FKT for the John Muir Trail. We learn the depths of suffering that “Long Ranger” Simoni is willing to endure. And we learn from Bryan what adjustments are made when one’s running partner drops midway through a pursuit due to injury. Strap in for a fun and inspiring conversation! Special appearance by producer Nick Mott talking about a recent story he did for the new Alpinist podcast, a co-collaboration with Dispatch Radio and Alpinist Magazine.